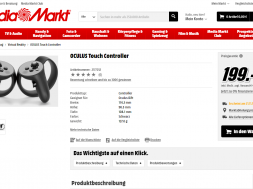 Media Markt in Germany announced the price and release date for the Oculus Touch controllers! The price will be 199 euro’s and the release date appear to be November 21 2016. 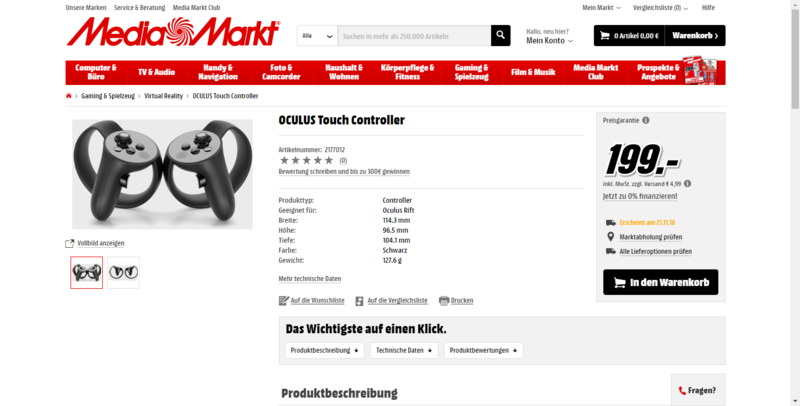 Furthermore, the specs of the controllers are shown. They are 114.3 mm wide and 96.5 mm high and the depth is 104.1 mm. The controllers weight just 127.6 g. We don’t see anything about a second sensor. The most striking is that no sensor is mentioned anywhere. Is the sensor still included? We are waiting for Oculus to comment.